Show your support for breast cancer research with a Pink Ribbon Leather Starter Set. Day-Timer will donate a portion of the proceeds from this product to The Breast Cancer Research Foundation. 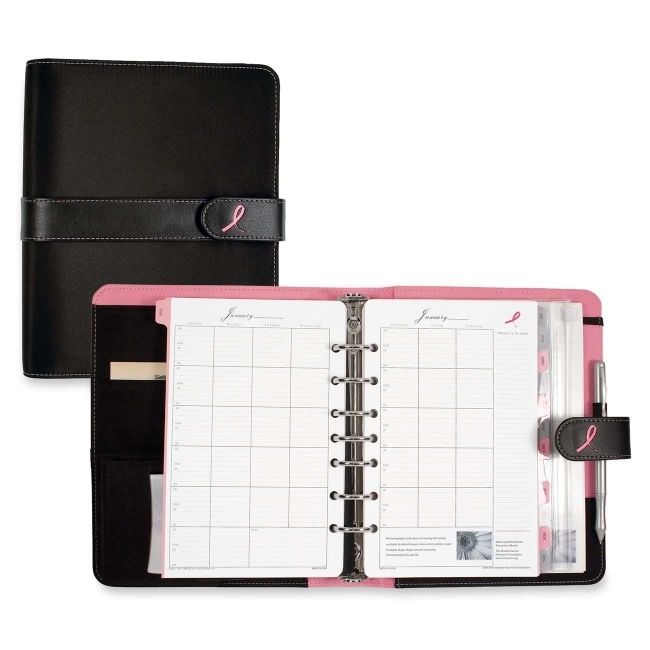 Starter set includes a black microfiber binder with magnetic closure, pink lining, pink ribbon deboss, standard full year of undated weekly pages and monthly tabs, address/phone, note pad, business card holder and vinyl zip pouch. Delicate pink and gray floral theme decorates the pages of this planner. Snap-tab closure on the binder keeps the contents secure. Binder has a 1" seven-ring element.